Change it up with the SF-S0636 twist in stepper. This fun stepper uses a small inward motion (stepping in) of the legs while the hips rotate slightly, making this stepper effectively target the inner and outer thighs. Target and shape your glutes and quads, while increasing your cardiovascular fitness. It has been proven working the large muscles while standing can burn up to 4 times more calories than just working isolated areas such as the arms and shoulders. As a bonus the twist in stepper requires more lateral movements in the hips that fire up the core, helping to strengthen and flatten. 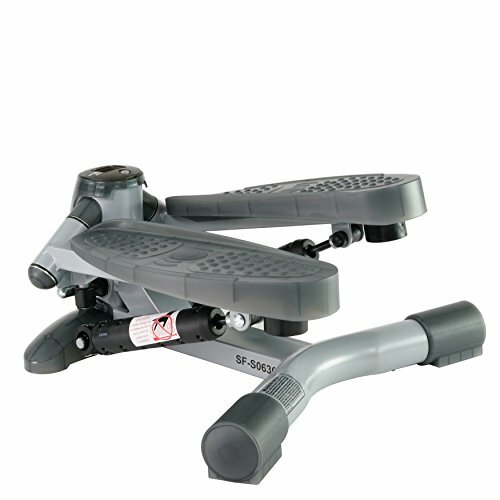 The twist in stepper has oversized non slip foot plates and sturdy steel construction to give the confidence to workout hard. Keep track of strides per minute, time, step and calories with the easy to read built in LCD digital monitor. Twist and Shout and feel the burn with the Sunny health and fitness SF-S0636.